This recipe is NOT for the faint of heart. At all. BUT. If you have the mental fortitude...and a lot of time on your hands...it is completely worth the anxiety and stress that you will spend on it. Completely. Let me start by saying: I am not an expert on chocolate. Nor have I ever made a rolled cake. Of any kind. So. Double risk for me. Concerning the first issue, I didn't let the chocolate cool enough before adding the espresso to it and ended up with seized chocolate. Mr. kindly ran to the store for more chocolate. On the second try, I kept the two separate, added them separately to the cake mixture, and all was well. I'll know better for next time. On the rolling issue, I just don't know what to say. Sometimes it turns out to be more like folding. If you saw Tyler Florence on the holiday Iron Chef America episode, you'll know kind of how it went for me. I may be a victim of my altitude yet again. Next time, I may mess with the cooking time. I think it just may have been *finger pinch* this much too dry. Luckily, this cake has more layers to roll. So by the outside layers, I was actually rolling (not folding), with only some occasional cracks. I kind of liked the way it turned out looking particularly stump-like with the flared out part on the bottom. The way a real stump flares out to its root structure. And also, thank goodness for frosting. I don't think you're ideally supposed to frost the top. You see, ideally, you should have a perfectly rolled cake with concentric circles visible from the top like a real stump. Obviously that didn't happen for me, so I frosted the whole darn thing. And did some "artistic" work in the frosting itself to make it look like bark. Then I put the whole thing in the refrigerator for a couple of days while I did the rest of my Christmas baking. I made a veritable field of meringue mushrooms as per Martha's instructions. And put every last one of them on/around the cake because they were too cute to leave any off. And gave the whole thing a final dusting of "snow". I was prepared, given my difficulties with the rolling, for the cake to look terrible and possibly even collapse when I cut into it. Imagine my surprise, when I got these near perfect slices. The chilling of the cake clearly helped it to really hold together. And the taste...was delicious. The malt powder adds such a unique flavor. I don't know that the Malted Buttercream is something I would want to eat by the spoonful, but combined with the deliciously dark chocolate cake and the rich chocolate frosting, it was surprisingly light tasting. And complex. And I loved it. TGIP Rating--Chocolate-Malt Stump de Noël--KEEPER. I'm making it every year. And eventually my roll will be a real roll that I can show from the top with pride. Next up: My baking year in review. A full year of baking and blogging gives me a lot to think (and blog again) about. Maybe I'll even choose a "Best of". ...a friend asked me at a party last weekend how many different kinds of pie I've made since I started blogging. The answer is 28. That does not include tarts or freeform pies (galettes). But it does include epic failures. Whew. That is a big number. It's been fun. I think I'll keep it up. Well, not my greatest successes. But neither was a complete failure, either. With the Mini Pies, I thought I could make a miniature version of this pie. I didn't think through a couple of potential problems. 1. Part of what makes pie crust so wonderful is when it's thinly rolled out and bakes up crispy and flaky. That's pretty hard to manage with tiny crusts. I suppose I could have rolled it all out and then used a biscuit cutter to cut the right size rounds and then tried (emphasis on the "try") to transfer those to the pan, but that just didn't seem feasible. So, I just used my hands to flatten and press little balls of dough into as thin of a piece as I could and pressed those into the pan. Pierced them with a fork and baked for 10 minutes. They were fine, just a little thick. So, then, 2. I could only fit a small amount of chocolate pudding in them and the proportion of dough thickness to amount of chocolate pudding was...off. IMO. And of course, 3. I was making these for a party and you can't exactly put whipped cream on a plateful of mini pies and then cover them with plastic wrap and put them in the car and expect them to survive. So, I had to do the last step of prep at the party. Which is silly. But the bigger problem was that this chocolate pudding, although a wonderful, easy recipe, is just a little too mild. I think it's great if you're just having chocolate pudding. But I've had second thoughts about my "like" of this as a pie filler. I think in a pie you need something more rich. And possibly more dense. I'm not talking about French Silk, that's a whole different matter. Sometimes that's what a person wants. And sometimes a person just wants a simple chocolate pudding pie. Which leads me to: give me your homemade chocolate pudding recipe! Whoever you are. I need it and you know you want to give it to me. 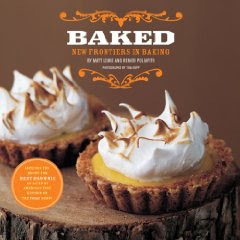 The Baked bars...I have a hard time saying this...because I'm such a fan of their book...but...I just didn't like them. I imagined them being like the Magic Bars I remember from my childhood, but...richer, denser, even more delicious. I don't know, maybe my backyard is shrinking. Or maybe it was the butterscotch chips. I imagine these bars would be delicious for somebody who really loves butterscotch. I like it well enough, but I thought the flavor overwhelmed the rest of the flavors in the bars. They're not difficult to make. At all. And I suppose it's easy enough to change the proportions of semi-sweet chocolate chips and white chocolate chips, and thereby just leave the butterscotch out altogether. But part of me thinks if I ever make something like this again, I'll go with the original. Chocolate Mini Pies--probably not worth the time or the effort of trying to improve on them. Next time I'm bringing a whole pie to a party, enough of this finger-food. Baked Bars--maybe you'll like them (if you had the book, and could see the recipe), but I really didn't. Next Up: Key Lime Cheesecake. I just happened to find key limes at the grocery store, so I figured I'd try a little something new. If less people were exposed to the first, the cranberry might not have been saddled with such a bad reputation all these years. I would like to "bring back" the cranberry. 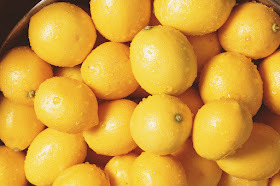 It is far underused in holiday desserts and other dishes. So, I was very excited to see this recipe involving cranberries, pecans, and BOURBON! My favorite! I wanted to give it a trial run before making it for Thanksgiving. And, success! It was delicious! I love the idea of toasting the pecans, it gives an extra boost of flavor. There is a LOT of sugar in this recipe. Enough that the pecans on top get nice and crispy with the sugar, almost like candied nuts. But that's a good thing. 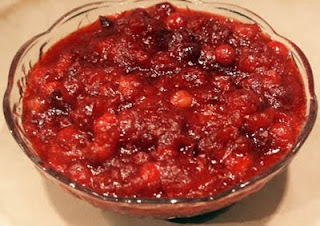 Cakespy said it best about the cranberries: "Adding a generous handful of tart cranberries (I know! Fruit!) to the Bourbon Pecan Pie worked on two levels: first, it tempered the extreme sweetness of the pecan-sugar-corn syrup mixture; second, it added a refreshing tang to the fiery, warming bourbon." And about the bourbon...do yourself (and me) a favor--buy good stuff. For novices, that means Maker's Mark, Knob Creek, or Buffalo Trace. Do NOT buy Early Times, Jim Beam, or, god forbid, Wild Turkey. You can really taste the bourbon in this pie--not the alcohol, the flavor of the bourbon. So, you need to use a bourbon that has a good flavor. 1. Prepare the pie crust. Put the flour, salt and sugar into a food processor and pulse once or twice. Add the butter and process until the mixture looks grainy. Then slowly, while pulsing, add the water until you can form the dough by pressing it between your fingers. Note: this can be done by hand as well. Decant the loose dough onto a piece of plastic wrap. Using the wrap, fold the loose dough towards the middle and press with the back of your hands to form dough. Wrap and chill for at least 4 hours before using. Dough can be made ahead for up to one week. Before you're ready to bake this pie, blind-bake the pie crust for about 10-15 minutes at 325 F.
2. Ready to make the pie? Preheat your oven to 325 degrees F., baby! 3. When you're ready to prepare the filling, put the corn syrup and brown sugar in a heavy saucepan over medium heat and cook, stirring occasionally, until the sugar dissolves. Remove from heat and add the butter, bourbon and vanilla. Let the mixture cool, and then add the eggs and whisk until smooth (don't add the eggs while the mixture is still very hot, otherwise you'll have scrambled eggs!). 4. Fill and bake the pie. Arrange the pecans and cranberries on the bottom of the crust. Carefully pour the filling over them (some will rise to the top, like magic!). Bake for 45-50 minutes, until the filling is set; rotate the pan halfway through baking time. This pie allegedly serves about 8--however, what the recipe does not mention is that the 8 servings may be the same 2 people four times in one day. As you can see above, I used dark brown sugar and dark corn syrup. I just think darker is better and more flavorful in most food situations. And, naturally, I used my own pie crust recipe. Because, damn, it's good. And look how flaky it is! If you haven't tried it yet, you should. Unless you're vegetarian--I'll work on that soon, promise. TGIP Rating--Bourbon Pecan Pie with Cranberries--KEEPER! Needless to say, I WILL be making this for Thanksgiving. One of three desserts. I am very tempted (in my attempt to "bring back" the cranberry) to make the cranberry tart I made the very first time I made Thanksgiving dinner in my home (1995! ), but one of the other desserts I'm making is this tart, and since I only have one tart pan---perhaps I'll make the cranberry tart for our Christmas Eve dessert-buffet-to-beat-all. And in the future--will I try this recipe with chocolate chips in place of the cranberries, for a CHOCOLATE Bourbon Pecan Pie? You bet your sweet bippy I will!